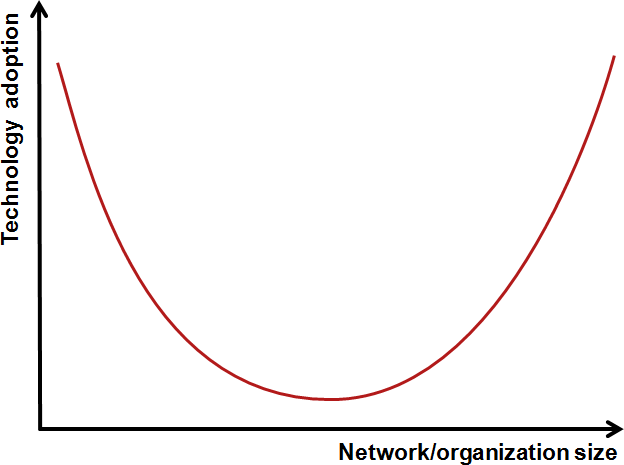 Simon Gordon introduced me to the magic U-curve during a fantastic meeting with the QFabric team more than a year ago. It turns out you can explain around 80% of IT phenomena with the U-curve (assuming you choose the proper metrics and linear or log scale) … and you can always try the hockey stick if the U-curve fails. The Facebooks, Amazons or Googles of the world that are quick to realize how they could benefit from the new technology and where the size of the potential savings quickly justifies the investment. In the middle, you have the typical enterprise customers who are (a) risk averse, (b) not gaining as much by introducing the emerging technologies and (c) too busy fighting existing fires to be able to spend significant time on testing new solutions. Amazingly, the same explanation works equally well for open-source software, cloud services, and SDN/OpenFlow. Even if you’re in the flat middle of the U-curve, it makes sense to introduce new technology in a controlled pilot environment. IPv6 servers in DMZ seem to be a classic example these days, and I’ll cover an OpenFlow/SDN case study in ProgrammableFlow Technical Deep Dive webinar (it’s sponsored by NEC Corporation of America and thus free – register now).